*Reeuwijk, the Netherlands – Last Saturday… peak time for pigeon fanciers with the International Barcelona… the National Cahors/Tabes and the National Chateauroux, the only long-distance race over the whole of the Netherlands, with distances of 500 to 800 kilometers! As we all know, the wind and the temperature made it very hard work for the pigeons on Saturday. 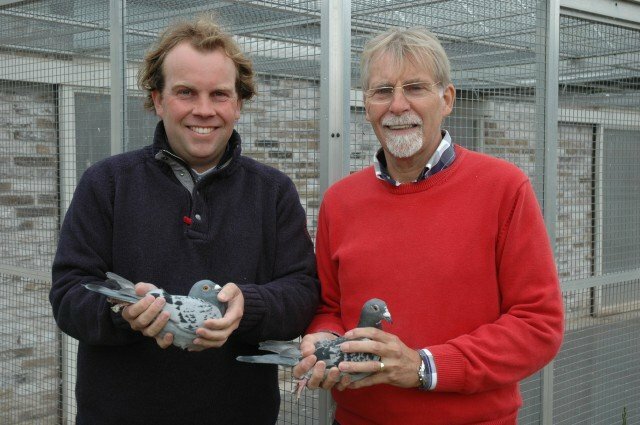 However, that didn’t appear to be a problem for the Verkerk pigeons, because even though their loft is situated in the longer flying drop of some 80 kilometers further than most of the lead pigeons, they performed a new miracle result (starting with 6th and 23rd national against 49,216 pigeons), like only Gerard and Bas can achieve! And on top of that, the cherry on the cake is 1-6-10-28-36-40-66-75-96 and so on from NPO Chateauroux against 6,609 pigeons (also 1-6-11 National S2 against 14,005 birds). Besides this, they are already at the absolute top in the middle-distance and long-distance races eight weeks in a row with 1-2-3-4-4-7-11-13-16 against an average of some 15,000 pigeons! At the end of March the racing team of Gerard and Bas started on widowhood (with a regular partner). The Chateauroux winner ‘Britt’ displayed some lesbian tendencies two weeks before the race, and was therefore locked in alternately. For that matter, this wasn’t her first test, because in 2012 she already became 7th Provincial Ace pigeon long-distance. The second upcoming pigeon is the ‘Andy Murray’, a son of the ‘Goofy’ (‘Pavarotti’ x ‘Oprah’) x the ‘Shine’ (‘Olympic Sponge Bob’ x ‘Bubbles’ from Ad Schaerlaeckens). He had already won 30th NPO Bourges against 13,592 pigeons… 30th NPO Argenton against 7,796 pigeons… 60th NPO Bourges against 9,896 pigeons and 85th NPO Chateaudun against 11,572 birds! 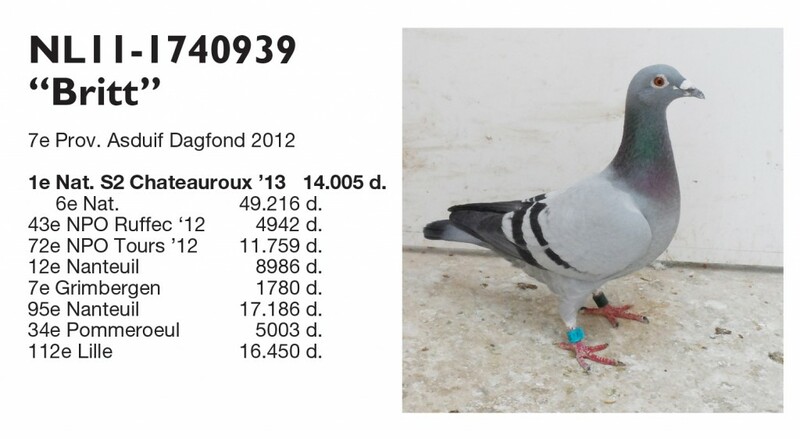 The third pigeon is the ‘Miss Kardashian’ out of the ’10-110′ (‘Brad’ x ‘Diddi’) x the ‘First Lady’ (2nd Peronne against 10,730 pigeons out of ‘The Aviator’ x the ‘Solana’, sister of the’Olympic Solange’). She had already won 8th Nanteuil against 8,896 pigeons… 12th Nanteuil against 6,905 pigeons… 11th NPO Ruffec against 4,942 pigeons… 28th Nijvel against 6,366 birds and 60th NPO Nanteuil against 9,527 pigeons. That the Verkerk pigeons also perform well in other lofts has been known for a long time. The 1st and 3rd pigeon from Yong Lin both come out of a son of the ‘Bulldozer’ x the ‘Olympic Solange’. 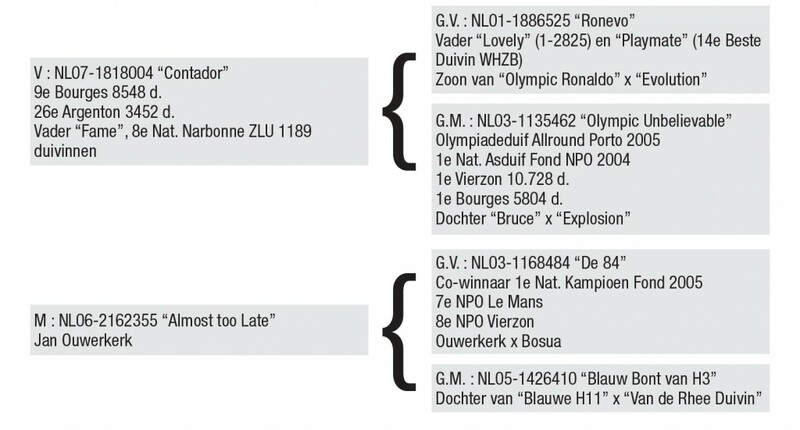 Burg & Waard bred their first pigeon (14th national S2) out of a brother of the ‘Goofy’ (‘Pavarotti’ x ‘Oprah’), out which Peter van de Merwe had already bred his 1st Provincial Sens against 28,413 pigeons. And last but not least the first pigeon (4th national S2) of Reedijk-Jongekrijg comes out of the ‘Street Fighter’, who also had much Verkerk blood in his veins.